Unless you live under a very deep, very dark, (very admirable-place to live right now) rock, you know it’s back to school season. AKA, one of my favorite and least favorite seasons ever. I know that’s a little contradictory, so allow me to explain. I like the idea of school–learning in class, working on projects, being handed back essays with fat A’s on them. Not surprisingly, I also like back to school shopping. I can’t resist a handful of new colorful spiral bound notebooks and I have a fetish for ball-point pens (I’m all about medium; fine-point has no place in this household). But in practice, I really despise school. I hate waking up at the ungodly hour of 5:30 am to get ready and be to class by 7. I hate that parking is an absolute nightmare any time of day, and there are zero spots available, even in the BFE of parking lots. I hate that I have to take math since I put it off until this last semester, and I really, really hate math. I’m an English major, and everyone assumes I want to be a teacher or something. There’s no way I want to teach annoying brats how to read, write or appreciate literature. Sorry, Dad, but teaching is definitely an acquired career move and I simply don’t have the patience. And when people ask what I want to do with an English degree, I kind of just shrug. And it sets off so many weird, judging looks. “So you don’t want to be a teacher or a writer… then what do you want to be?!? !” As if this question was A) any of their concern; or B) their life depended on a seemingly-plausible-sounding answer to their liking (which would have been a teacher or a writer). To be frank, I chose to be an English major because, since I already have an immense hatred for school and I’m really good at writing, I figured English was the easiest way outta there for me. Honest. But people do NOT like hearing this. I’m 20. Do I have to know? And is English really that limited of a major that it wouldn’t be applicable to any FREAKING job on the planet? College is college. My mom has a degree in fashion merchandising but works in a traffic court. I could have a bio-mechanics engineering degree from Harvard but decide to be a librarian. It really doesn’t matter, so why should my unused English degree be of anyone’s care? Last I checked, I was writing this in English. And you’re reading this in English. So, tell me again why my degree seems wasteful without going into a writing/teaching English field? Right. I had some blueberry muffin mix in my pantry that I’d been meaning to use, but had forgotten about behind mountains of cake mixes. I dug it out today and baked some, but then had a semi-genius idea of turning their average muffin-ness into a muffin truffle. On a stick. I should get a degree in that alone. 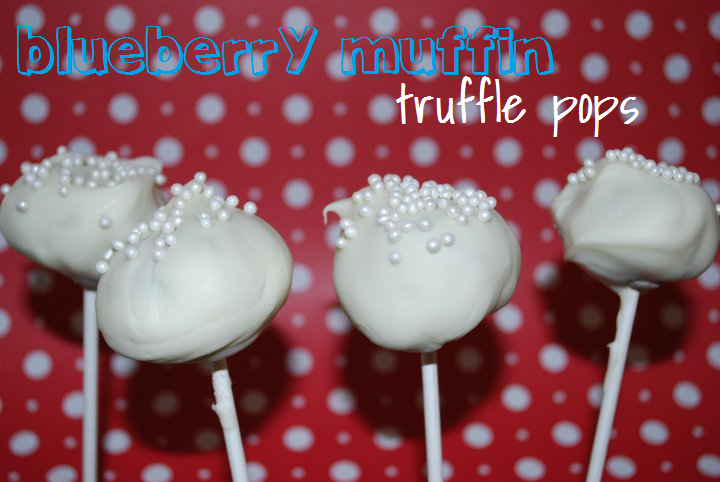 These have basically the same concept of a cake pop, but made with a muffin. I used blueberry, but I’m assuming any kind of muffin mix would work, as well as any flavor candy melt–chocolate chip muffins with chocolate candy melts, anyone?–but I just like this because it was easy, fast, and a perfect pick-me-up for my depressing life. 1. Prepare muffin mix according to package directions, bake, and cool completely. You’ll need about 12 regular-sized muffins, but mine made 15, so I used all of them. 2. Crumble muffins into a large bowl. Remove harder-edged pieces if needed; you want a small, fine crumb. Add the cream cheese frosting and combine with hands until thoroughly mixed with the crumbs. 3. Wet hands and form into small inch-sized balls. Place on a wax-paper lined baking sheet and place in fridge about 3-4 hours or in the freezer about 1 hour until chilled and solid. 4. Prepare candy melts according to package directions and remove chilled muffin truffles from the fridge or freezer. Dip the tip of a stick in the candy, then spear a truffle. Dip the truffle into the melted candy and twirl, coating it thoroughly. Sprinkle with jimmies or edible pearls while damp. Place lollypop stick into a styrofoam round or block to harden. 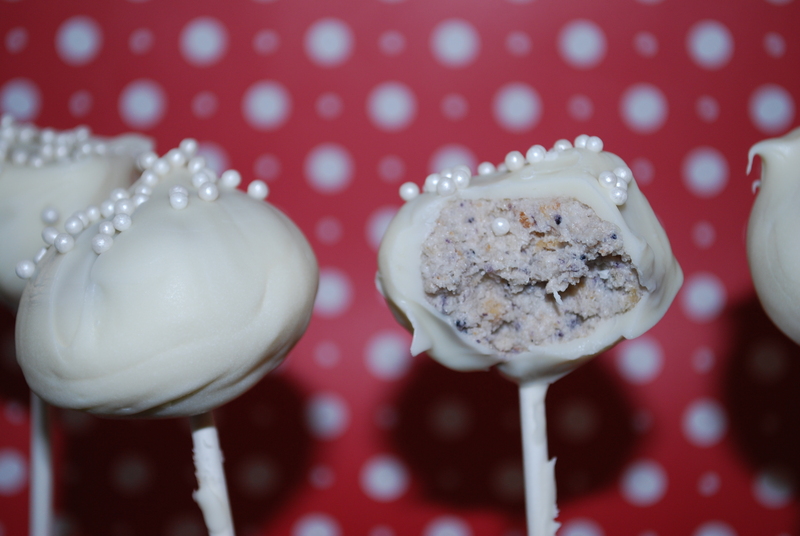 These are a good twist on the average cake pop–and a pretty darn smart idea. If I weren’t completely biased, I would say my entire blog is worthy of a seriously cool degree in Bad-Assery, but I’m kind of partial. Do you have any ideas on how to wrap this as a gift? Hi Michelle! I know Michael’s craft store has some really cute cake pop wrapping packs you can pick up for cheap, but when in doubt, I wrap these up in some cellophane and tie them just under the base of the cake ball with a cute ribbon. Also, if this is a holiday gift, check out your local dollar store. I’ve been able to stock up on really cute holiday treat bags which would be excellent to use for wrapping as well. AND! if you’re thinking of doing these in cake balls, put a bunch in a cute snap-top jar and wrap it up. Hope this helps! Just one more question. Your ingredient list calls for packaged muffin mix. I a, assuming that homemade muffins would work equally well? I’m assuming so! I just used packaged mix since I had it on hand and didn’t want to make muffins with it 🙂 I’d like to know how homemade muffins taste if you end up using those instead!